(5).Use Places: Office, Home Living Room, Kitchen, Bedroom, Bathroom And Home Construction area. (1). Keep.the Small Personal Air Conditioner Blance, Don't Tilt It When working. (2). Add Pure Water Or Household Tap Water, To Avoid Affecting.the Cooling Function. (3). Adding 3/4 Water In.the Tank Is.the Best, Do Not full-filled. (4). Please Run Out Of.the Water Every Time, To Prevent.the Water Tank Left Some scale. (5). Use Cup Brush Or Toothbrush Clean.the Water Tank Once A Week, Keep Clean And healthy. Is It Especially Hot This summer? Are You Can't Stand.the heat? Don't Wait, Just Scroll Up Mouse And Click.the "add To cart" Button Now, You Will Get It soon!! Please Keep The Mini Air Conditioner Balance,Don't Lean Or Upend To Prevent Water From Leaking out. Works Via Any Usb Power supply. It Can Be Run By Using A Laptop, A Power Bank Or A Wall outlet. You Just Need To Fill The Tank With Water, Plug It Into A Power Source And Enjoy Refreshing air! Portable - use it at home or at work,Lightweight design,Very easy and convenient to carry|Perfect for home,Office,Travel. 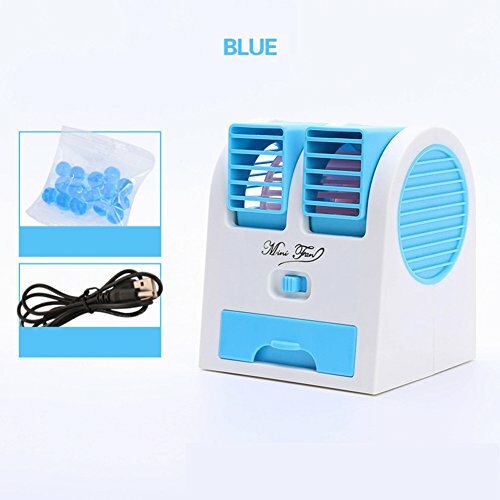 Energy efficient & eco-friendly - portable space cooler is environmentally friendly and uses no ozone-depleting refrigerants, This mini air conditioner fan is really space saving and economic as a simple small circular fan. Adjustable - change speed, Add ice to water in the water tank to make air more cooling & fresh.